I hope everyone had a festive and fruitful holiday season. Next up is the new year and with it comes new gaming opportunities. I am excited to say that I have a new game starting up on January 7th, and the reason I have not updated the blog is due to my work on the game. It is more of a sandbox adventure that is set inside a kear, read dungeon crawl, in the setting of Earthdawn. For anyone familiar with my last campaign, it is a specialized segment of that game. The character's will not have the far reaching goals that I had hopped for in that campaign, but this campaign should prove interesting. I do hope the players will take some interest in the politics of the game and choose sides accordingly, but if not, the adventure serves well as a dungeon smash. On a similar note, as with most of endeavors, this particular game has a quasi-epic story arc. I know many people like to you use long term bad guys in their games. I received the D&D 3.5 supplement "Elder Evils" for Christmas. I've been wanting it for a while because when I flipped through it, I saw a pic of "Zargon, the Returner". 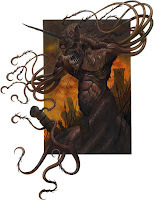 This was an iconic monster from my younger days of D&D and while the original adventure, B4: The Lost City, was a nice dungeon tromp for my adolescent mind, there was little explanation of the full story or how all the creatures got there. Elder Evils expound on the Lost City and helps bring the epic story arc into light, as well specific encounters at various points of the character's level advancement. It gives blanket rules on how to use 'signs' to herald the coming Evil as well a giving you some lesser adversaries and maps of locations key to that Eldar Evil's rise to power. While Zargon is what piqued my interest, the four other I have read so far are also interesting. I would encourage anyone crafting a long term campaign, with an epic battle of good and evil, to take a look at a few of the entries.